Red Hill is a clasic race, and yes while some people line up to win, most of us line up for a training run. At the moment 36.2km is a little further and I would choose to run but it's such a nice 'race' I always find myself on the start line. 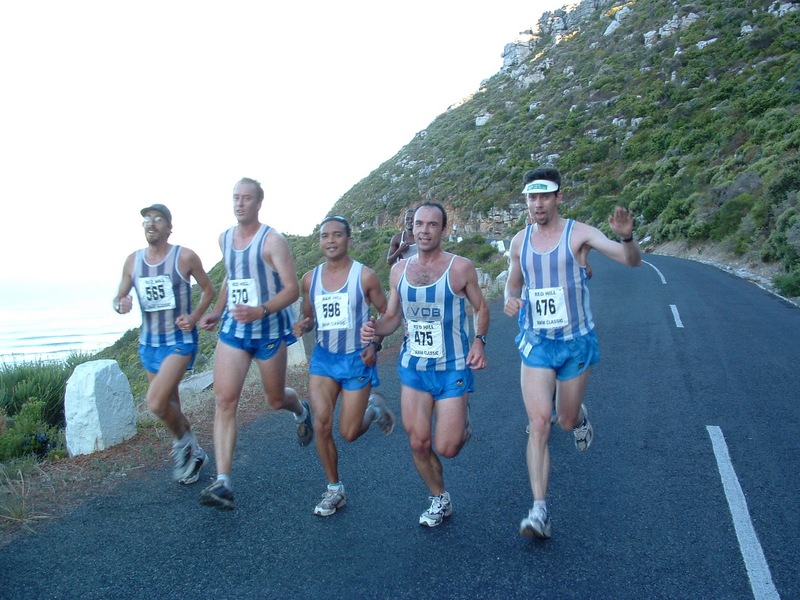 Of this group only Stef (far right 476) was there... but he was running slower, so I was with Ake, Damian, Eddie. 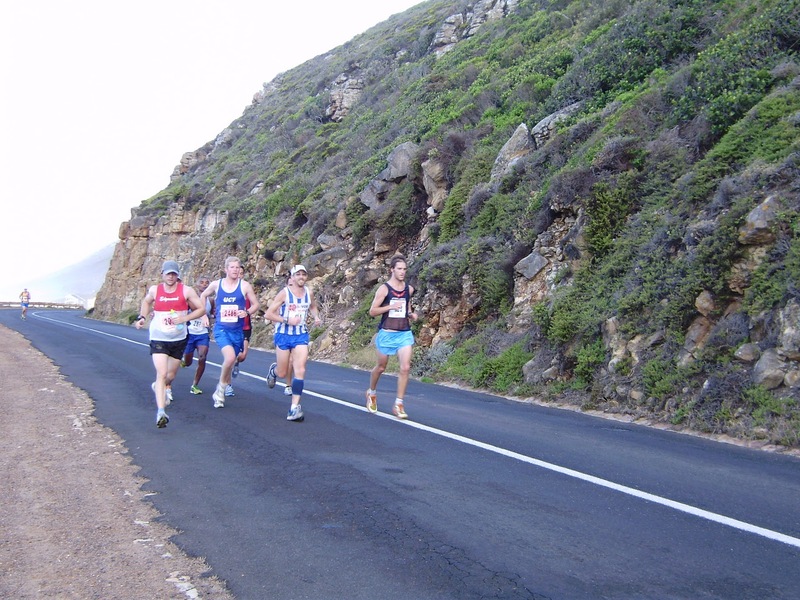 We set off at 3hour marathon pace 5km 21:11, 10km 43:06 as we climbed the first of the mountain passes!!! 15km down the other side 61:41. At this stage Jimmy (from Bay to Bay 2 weeks ago) and Andries, also with us, but running the marathon, (at 20.5km they run a 6km out and back loop) had to up the pace just a bit if they wanted a sub 3. Andries pulled of the front, he would end with 3h00:22, so close! The rest of us just ticked over for the next couple of km, but then as the climb started (more a gentle pull) Eddie and the others dropped off leaving Damian setting the pace, I was struggling! and Ake was hanging in, and he was also about to turn right on the marathon loop. I stopped for a sec at Dawn on the side of the road and put on my shades!!! I was read for RED HILL!!! I closed the gap on Damian at started the climb passing 21km in 89:59!!! Yes I pulled away from Damian overtaking 2 other guys (both 40+) but I wasn't running easy, the body felt heavy and awkard! I closed the gap on Cliffy and 2 other 40+ guys, catching 1 at the top. I don't like to hammer that down hill, you drop 230m in 4km and if you let the breaks off you will end in the OCEAN!!! 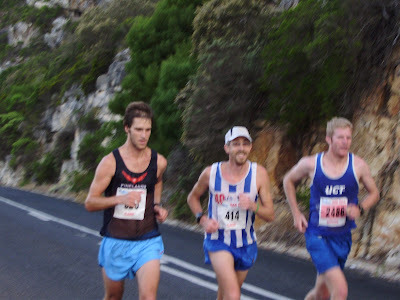 That said I was running at 3:40 and soon caught Cliffy and the other 40+ guy from Paarl. Bottem of the hill and 7km to go. In the past we have taken it really easy till now and then all hell breaks loose!!! I was on my own and I just wanted to run in and enjoy the coastal road. I kept thinking I would blow, and slow to 4:30's or even 4:40's, but I just kept on ticking over at 4:10ish. The front of the field is small and I had no-one to chase or the run with, it was really a case of 'The Loneliness Of The Long Distance Runner'! Dawn finaly caught me after watching all her friends further back in the race, it was nice to see her and the puppies on the side on the road. She didn't follow me in, but went back out on the route leaving me to run in all alone.NO, not a case for tears, but shouts of joy!!! I was 7th and 1st 40+ in a time of 2h32:43. So the question is: How do you know you didn't run to hard in the weekend training run? I run on the weekend to avoid things like grass-cutting and painting or any forms of housework. You should take a leaf out of my book. Sounds like a good day... minus the mowing the lawn! Great blog - loved this report!